On Saturday morning the KM4Dev core group was joined by all those participants who were interested in KM4dev community “business”. The morning was divided in two sessions: One that was looking at the history, context, purpose, challenges and opportunities of the Km4Dev core group, and a second session where we explored in groups issues, and ideas related to our community. What are possible Criteria & KM4Dev quality standards of joint projects? What are the expectations from KM4Dev for sponsored participants? How can we finance our meetings? The strong feeling that it is time to open regional chapters and that there is lots of energy out there to go ahead. Yeah! The wonderful idea of the community day: straightforward, easy, and energizing! The KM4Dev workshop started with a Day 0, a day for newcomers to discover the community, it’s core group of people, it’s history, it’s communication channels, and the context and challenges that community members are involved in. “This first day was much about identity issues”, said Ewen Leborgne from IRC. It seems that some people here are very into the community and enjoy mapping it whereas other participants are users of KM4Dev resources and don’t feel the need to map relationships. It was incredibly brave that Eva took the lead on the exercise and showcased the value of experimentation with Km tools. 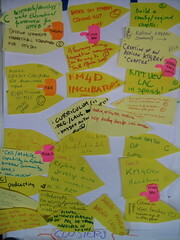 All the reactions and workshop notes are documented on the KM4Dev wiki. 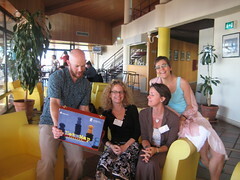 Follow the KM4Dev workshop blog. This pre-workshop discussion was launched as a follow-up of the KM4Dev workshop survey, and as an attempt to involve all members prior to the workshop. W hat are your big questions re. impact or measurement of KM initiatives? Alternatively, what have you been trying to do to find out how well your KM initiative is doing? How have you been able to “prove” that it has born fruit? 1. 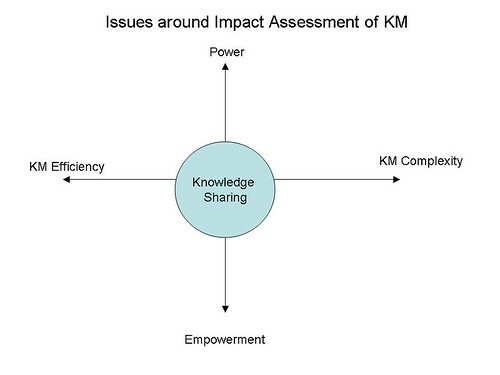 Complexity: Impact of KM and KM as a complex, long-term process. Many examples, tools and methods have been shared that can help, like participatory approaches, storytelling, Social Return on Investment, process documentation etc. 2. KM efficiency and effectiveness: Versus the attempt to embrace complexity: cost effectiveness, demystification, looking at interventions, concrete obstacles. Quantitative requirements are coming from our organizations and donors. Within this topic a discussion thread is about oprganizational and donor requirements and how to meet their mostly quantitative data requirements. 5. Importance of Knowledge Sharing: Share or perish, open source attitude, KS is our contribution to development. The annual KM4Dev meeting will be held this year from 18-21 June at the Pousada de Juventude Hostel in Almada, Portugal (just outside Lisbon). As with previous meetings, KM4Dev wants to use the opportunity of KM4Dev participants – new and old – getting together to discuss real issues with which we are dealing in our ongoing work. In other words, KM4Dev 2008 is meant to bring us together for collective thinking about a range of key challenges, solutions, experiments, and ideas with a view to helping each of us go back to our individual work contexts with renewed energy and new thoughts about how to do what we do – and how to help others with whom we work do what they do – better! The 3-day meeting will be held in Open Space Format. More at the KM4Dev Wiki.